Even though Accidental Icon: The Real Gidget Story is several years old, it's responsible for one of this weekend's coolest screening events. The hour-long documentary was directed by Brian Gillogly and is narrated by Jorja Fox, star of the CBS series CSI. Many of the actors, writers and directors who brought Gidget to the big and small screens share their behind-the-scenes perspectives, including Sally Field, Cliff Robertson and James Darren. Also appearing in the film are surf legends Layne Beachly, Mike Doyle and Mickey Munoz, to name a few. But here's where it gets really good. 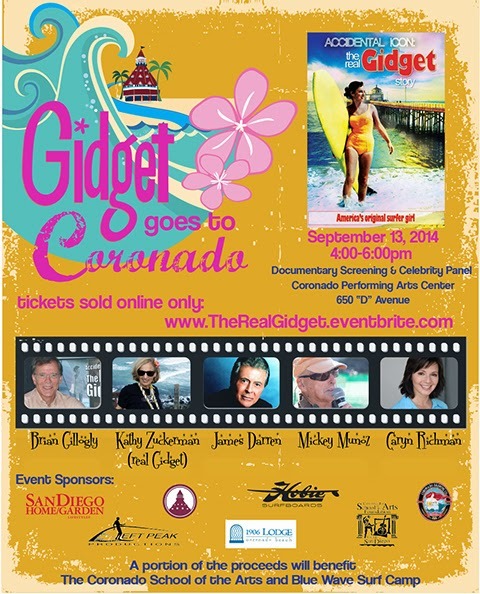 The real-life inspiration for the Gidget character, Kathy Kohner Zuckerman, is in attendance. She, Gillogly and Munoz are doing a Q&A, alongside Bill “Moondoggie” Jensen and Caryn Richman, star of 1986-88 TV series The New Gidget. Then there's a VIP after-party. For an additional $60, from 7:30 p.m-10:30 p.m., lucky locals will get to shake, shimmy and roll at a private residence right on the water with Kohler and co. Along the way, she is also signing copies of her 2001 book. In other words, a whole lot of Gidget. My wife has never been on a surfboard in her life while I have surfed for 47 years. I got this DVD because I am aware of Kathy's environmental work and also interested in the story beyond the movies and TV shows. As a surfer, the movie was engrossing as it featured a who's who of surfers from the early days who all knew "Gidget" and it was interesting to see how this young girl got involved with famous surfers who were instrumental in the sport's early days, as well as her relationships with those that were on the entertainment side (movies, TV) of the Gidget story. Even more important was the reaction of my wife who enjoyed this equally as much as I did. It's one of those movies that when you realize it's coming to an end and wish it would keep on going.